In 2006, the Seattle Parks and Recreation Department renamed the nearly 2.5-acre neighborhood park located in Seattle's Central District, Jimi Hendrix Park, with the goal of turning it into a community gathering space honoring this Seattle-born artist's extraordinary life and musical legacy. The Park lies adjacent to the old Colman School, which since 2008 has housed Seattle's Northwest African American Museum. Now, a dedicated group of Seattle residents has come together to turn the dream of a park inspired by a "West Coast Seattle Boy" (the artist's own description) into reality. Named the Friends of Jimi Hendrix Park (FOJHP), the group has met for over a year, laying the groundwork for the development of a space that will draw visitors from across the globe. In keeping with the spirit of unity underlying the project as a whole, the Friends are committed to seeking community input into every aspect of the Park, from fundraising to design to programming. At the core of this project is the belief - embodied best by Jimi Hendrix himself - that with talent, determination and passion, anything is possible. Colman school was built in 1909 and named in honor of James M. Colman in 1910. The school's playground was situated just east of the building allowing for spectacular views of Mount Rainier. The Parks Department originally acquired the school's playground, which is now the current parking lot, in 1948. The state highway department's (WSDOT) plan to "widen" I-90 raised a storm of controversy, threatening to obliterate Colman School and it's adjacent playground, along with other Parks property in the vicinity - Judkins and Colman playgrounds - which were well established by 1915 and 1930 respectively. WSDOT purchased the old Colman playground and used the site for their construction staging. 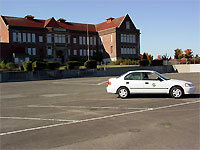 Parks leased the site from the state in 1997 after the I-90 lid project was complete; however, WSDOT continued to use the site for parking. It is currently fenced and used for parking during scheduled soccer games at Sam Smith Park. The project kick-off meeting was held on April 3, 2003 and was attended by over 20 community members. Parks staff presented the site analysis, early concept plans and a variety of program elements for community feedback. At the second meeting, held on May 15, 2003, Parks staff presented Refined Concept Alternatives based on feedback from the first community meeting. Key issues include: vehicular access on to the site, noise modification through landscape design, inclusion of organic components in the design layout, and overall design fit within the neighborhood and contextual uses. Staff outlined the project budget and phasing ideas and sought consensus on one site plan for further refinement and presentation at the third public meeting. At the third meeting held on July 1, 2003, Parks staff presented a Recommended Final Design Plan based on feedback from the first and second community meetings. Site integration with the surrounding neighborhood including removal of existing fencing and portions of the retaining wall. Key issues from the third meeting include: design fit of the site plan within the contextual history of the neighborhood, concerns over potential noise levels with the proposed skateboard park, and pedestrian and ADA access onto and through the site. On April 24, 2004 a Project Open House was held. The objective of the Open House was to present the final design elements and plan for the Colman School Parking Lot project to the Community. The design elements and plan were developed with input from community members who participated in the three previous public meetings. All previous meeting attendees were invited to attend. A copy of the final design plan is posted on this site. A number of elements of the earlier design have been dropped in this final revision due to a lack of funds and/or community support. In developing this project, Parks has coordinated and integrated the design elements and plan with the Urban League's redevelopment project at Old Colman School to ensure a successful blending of projects. Parks is also coordinating with State and City agencies on access and use issues. These design elements and plan are now being transformed into formal construction plans with specifications that will allow Parks to proceed to the construction phase of this project. The schedule listed below is our current project schedule. The Pro Parks Levy funded portion of this project is complete. Hydro seeding was completed in May 2006. Turf establishment is underway. The asphalt walk/path is complete. The park will be open for use when the grass establishes. We anticipate that will be late fall 2006. Again, Parks would like to thank Seattle Public Utilities for the generous $24,371 Storm Water Retention Grant which was awarded to this project. The fund allowed parks to completely remove all asphalt paving from the site and construct a site specific new parking area. The removal of approximately 69,000 square feet of impervious asphalt greatly increases the strom water retention or recharge in the area. Parks has begun to investigate the final design for Phase II of this project, and is seeking additional funding to allow for its construction. ... and this is where the story of Jimi Hendrix Park and The Jimi Hendrix Park Foundation begins!